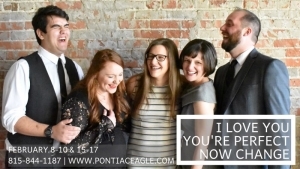 Fitting for the time of year, the second-longest running Off-Broadway production, focusing on love and relationships, continues its run at the Eagle Theater in Pontiac. 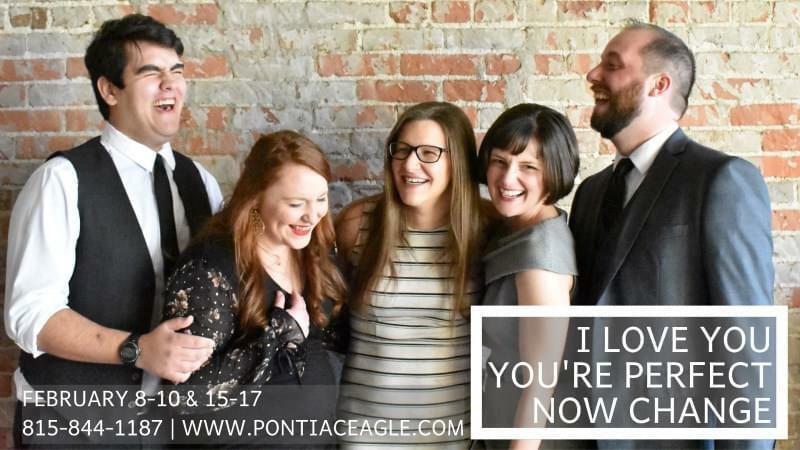 “I Love You, You’re Perfect, Now Change” is a series of humorous vignettes dealing with dating, singles, relationships, and marriage, told mostly through song. The production might not be suitable for all ages and tastes as it deals with all aspects of adult relationships. The show, which has run Off-Broadway for 12 years, is put on by the Vermillion Players, and will run continue its run this Friday and Saturday with doors opening at 6:00PM, and on Sunday opening at 12:30PM. The production is directed by Sarah Bertram and stars Melissa Barton, Colton Cottrell, Anthony Gullo, Meghan Harper, and Brittany Roper.